Shell prawns leaving tails intact. Make a slit at the back of the prawns and devein. Dry prawns with a tea towel and marinate with seasoning (A) for 10-15 minutes. Dip seasoned prawns in combined breadcrumbs and rice flour mixture. Heat oil in a wok until hot. 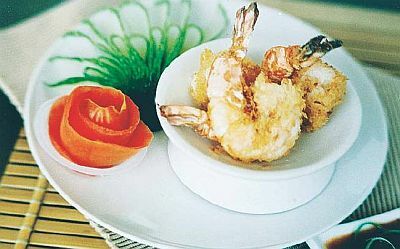 Deep-fry prawns until golden and crispy. Serve the prawns with the dipping sauce.